Why should you buy a Nordic Track Commercial 1750 treadmill? Treadmills are a great addition to any home gym or as standalone fitness devices. Treadmills have the advantage over pavement running as it does not leave you at the mercy of adverse weather conditions. This means that you can construct any gym regime without it being interrupted by rain, wind or snow. Only running when the weather permits is a serious disadvantage in terms of fitness. Another advantage of treadmills is their convenience, as workouts can be done in your own home with a TV, radio, and water nearby. You can set your speed and know exactly how many calories you’ve burned, as well as distance and performance. You do not have to worry about uneven terrain, which could result in injury. Treadmills can even be a great investment in the amount of money saved on running shoes. These tend to wear out within 2 months for serious runners on a ground that is not flat. Treadmills are safer than running outdoors. You won’t get hit by a car when running on a treadmill, and you won’t bump into pedestrians or fall over an uneven piece of ground. Treadmills can be a little bit boring if you run in silence staring at a blank corner of a wall. Due to this many treadmills have screens added with radio systems and clever interfaces. Many even have facilities where you can upload your data straight away to the cloud, so you can browse through what you have done in previous sessions across multiple variables. This trend is set to continue as technology gets more intricate and sophisticated, as more biological variables are “caught” and are uploaded in real time to the cloud where the data can be analyzed and looked at by the consumer. Most treadmills can now connect to phones and tablets so you can stream Netflix, YouTube, and other online sites to alleviate boredom. Failing this it is always possible to simply listen to music from one of your devices, such as your mobile phone, to prevent the monotony of a regular treadmill running. Before buying a treadmill, there are a number of questions you have to ask yourself. The answers to these questions will determine which type of treadmill is right for you. First off, are you going to be using the treadmill for walking or running? What is your weight? What is your height? Do you prefer advanced technology on the treadmill to alleviate boredom and maximize workout efficiency? How much are you willing to pay? Are you willing to perform regular maintenance on the treadmill? All these questions will have a bearing on what type of treadmill is right for you. There are a number of treadmill specifications which are important to consider when purchasing a treadmill. When buying any product, there is invariably a tradeoff between sturdiness and flexibility. There are heavy duty items which tend to last longer and are heavier and sturdier. Then there are light objects which tend to wear out faster but also look better and are easier to move around. In terms of treadmills, lighter treadmills will tend to bounce and if a light treadmill is on the second floor or above, it will tend to make a heavy thump with every step taken. This does not happen with the heavier treadmills, which last longer but tend to be more expensive. If you are a heavier person this is a serious consideration, as you do not want to invest in a light treadmill. It will wear out too quickly and will not feel stable like solid earth normally would. When choosing a treadmill, it can be good to compare with other online commercial treadmill reviews. In today’s technological age, the technology that comes with a product is very important. When choosing a treadmill, play around with the interface first. This ensures you are comfortable with it and it can do what you want it to do. If you have a specific program such as weight loss make sure it can do what you want it to. There are also features to upload your stats directly online, which is always a neat feature to have. And before buying a treadmill note how often it needs maintenance. Treadmills are the most frequently used items bar none, and thus need frequent maintenance. They have to be able to withstand the pressure of a whole person running for prolonged periods, and thus need to be properly serviced to ensure they last as long as possible. They are not cheap items. Finally, know that there is a treadmill for running and a treadmill for walking. Know what you aim to achieve first before purchase. There are also treadmills which are designed solely for sprinting. Armed with all this knowledge we will now engage in a NordicTrack Commercial 1750 Review to add to the many nordictrack reviews accessible online. There are many nordictrack commercial 1750 reviews. This treadmill has been touted as one of the best treadmills in 2019. There are many reasons for this, and possibly the main advantage of the nordictrack 1750 is that it has a super advanced, user-friendly touch screen user interface. In a technological era, the interface is key. It has an all in one control center with a 7 inch, high definition touch screen interface. This advanced screen has many features, where you can access email as well as monitoring the progress of your run. You can also engage in social media, regular news and other options which will make the run easier. There is also a bracket where you can hold your own tablet and connect it to the treadmill itself, though this may not be necessary as you can perform many functions on the treadmill interface (let’s face it, you won’t really be typing on an Excel spreadsheet while trying to beat your personal 100-meter record). The built-in applications are superb on the NordicTrack 1750. It has a number of workout apps which encourage the user to reach his or her goals and all the programs are designed by a certified fitness professional. If also features a subscription only application called the iFit Coach Ready. This features unlimited workout designed by professionals and analytical statistics to be utilized. It is a form of AI which adapts to your fitness activity and gives advice on sleep, diet, well-being, nutrition and exercise. 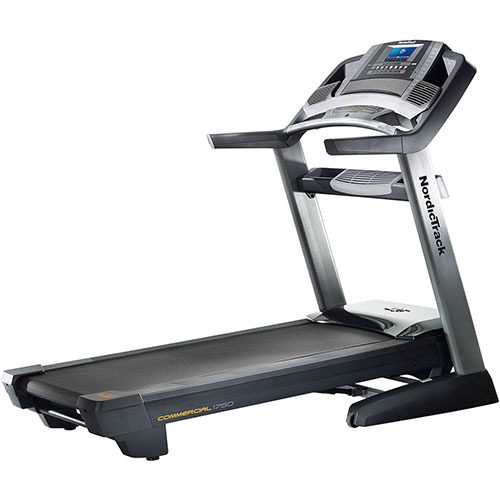 The NordicTrack 1750 features a 15 percent incline and a 3 percent decline. This means it can perfectly emulate both uphill and downhill running which is a useful feature for many runners and for a variety of training purposes. While many treadmills have this incline feature, the decline feature is quite rare and is usually only seen on high-quality treadmills. It has a top speed of 12 miles per hour, which is not an absolute top speed in terms of treadmills but this is actually a good thing. 12 miles is more than really necessary and going faster than this for prolonged periods will wear out the machine quickly. The dimensions of the product are 72.25" L x 34" W x 61 H. It contains 38 programs and has an excellent interface. It is a fantastic treadmill for a variety of reasons and can even be folded easily despite its weight. It comes with a lifetime warranty on the frame and motor as well as two years of service. It is perfect for the vast majority of runners and has a number of useful analytical data features, with a perfectly streamlined interface. It is not an entry level treadmill for casual runners but is worth it for people who take their fitness seriously. It is a luxurious piece of machinery for those who love to run or walk. The only real issue with the NordicTrack 1750 is that setup can be cumbersome in some instances. However, there are many online videos which can assist with this, though in it may require the assistance of a few neighbors to help set up. Aside from this, there are many other nordictrack treadmill reviews which attest to the quality of the product.